West Chester is a thriving modern American town that honors its historic past and has become a sought-after location to live. First known as Turks Head, the town was a frequent stop for travelers before the American Revolution. Later, Abraham Lincoln's first campaign biography was printed in the town. West Chester is the seat of government for Chester County, one of the most affluent and best governed counties in the nation. 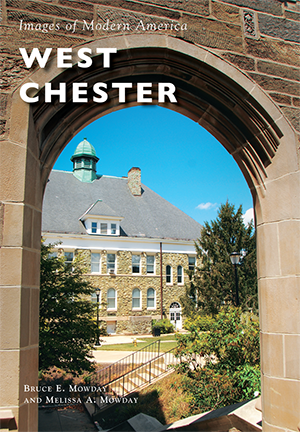 West Chester and the county have been named repeatedly by a myriad of national publications as one of the top places to live, work, and raise a family in the United States. The community offers many exciting events during the year, including a professional bicycle race, parades, and art and restaurant festivals. West Chester's famous residents include composer Samuel Barber and artist Horace Pippin. Authors Melissa and Bruce Mowday have collaborated on one previous book. Melissa is an adjunct instructor at Saint Joseph's and Widener Universities, while Bruce is an award-winning journalist and author of more than 15 books. The photographs are courtesy of the West Chester Business Improvement District, photographers Ray Doyle and Katrina E. Garthe, the authors, and West Chester residents.